So, at the beginning of 2017 I set a whole bunch of reading goals to help myself stay on track to read lots of different types of books and find new favorites. Since we’re halfway through the year (what?!) 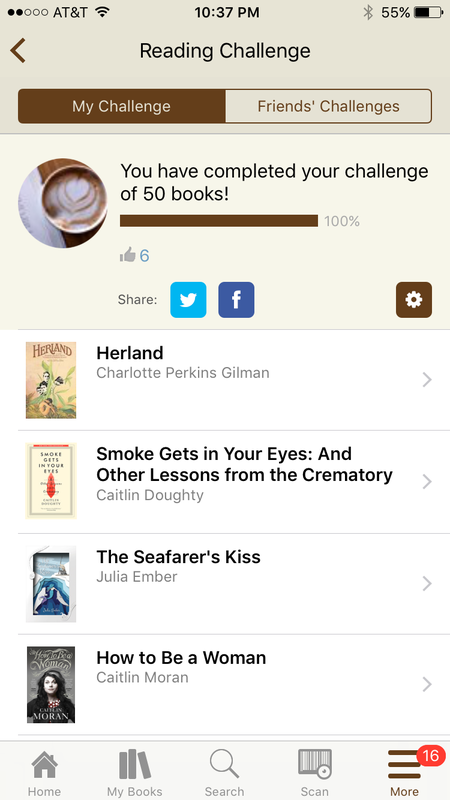 and I just met my Goodreads goal of reading 50 books (yay! ), I thought I’d do a progress check-in for myself to see which goals I’ve actually been accomplishing and which I need to give a little more love to in the second half of 2017. How am I doing? Not too shabby! Thanks to the help of the Serial Reader app, which I discovered on Litsy, I’ve finished 2 classics so far in 2017 (which is 2 more than I read in 2016), North and South by Elizabeth Gaskell and Herland by Charlotte Perkins Gilman, and one of those is what I’d call a “longer classic;” North and South was 531 pages long. How am I doing? I could be doing a lot better; I definitely need to read more books by diverse authors in the second half of 2017. Right now I’m in the middle of listening to The Hate U Give by Angie Thomas on audiobook, and I’m also currently reading Hunger by Roxane Gay, but looking through the 50 completed books on my Goodreads shelf, very few are by #ownvoices authors. How am I doing? According to my Goodreads shelves, which I think are up-to-date, so far 28 of the 50 books I’ve read have been from my physical TBR shelf. I honestly don’t know if that’s a good ratio or not; it does seem like I’ve been reading a lot of physical books vs. library books, but library audiobooks are throwing off my ratio. How am I doing? OK, but not great. I’ve read four 500+ page books so far this year: North and South by Elizabeth Gaskell, Stiletto by Daniel O’Malley, Replica by Lauren Oliver, and The Queen of the Night by Alexander Chee. The amount of big books I finished isn’t bad, but there are so many really long books on my TBR that have been there for so long that I’d really like to tackle. How am I doing? On one hand, I have read some lesser-known books and I did pick up a bunch of books from indie publishers at BookCon, but on the other hand, I do feel like a lot of my reading this year has unintentionally focused on popular 2016 and 2017 releases. How am I doing? Hmmm. To be honest, I’m not sure that I can honestly say that any author I’ve discovered so far this year has become a new favorite. I’ve found new authors that I’ve really liked, but I can’t really say that there have been any that I’ve necessarily loved. So that’s a bit unfortunate. I guess that’s something I really need to address in the next six months. How am I doing? Well, so far I’ve read another book from only three already-loved authors: Jeff Vandermeer (Borne), Roxane Gay (Difficult Women), and Ilona Andrews (Magic Binds). So, not very well. How am I doing? Pretty well! I’m trying not to let myself feel guilty for picking up “fun” reads rather than more highbrow literature when I’m in the mood for it. So, in addition to my stated goals from the beginning of the year, I also have a few “secret goals,” which are reading goals that either seem silly or unrealistic so I didn’t write them down. The first of these goals was to read 100 books, which I’ve never before been able to accomplish in a year. I didn’t want to make this an “official” reading goal, because I didn’t want to put pressure on myself and dissuade myself from picking up longer reads when I’m in the mood for them. Since I’m already at 50 books, though, I may just make it. My second “secret goal” is to win a giveaway on Goodreads. I’ve been entering giveaways for books I’m interested in since I joined Goodreads and have yet to win one. I’m definitely picky about what giveaways I enter, since I only want to win a book if I’m genuinely excited about wanting to read it, which means that I do enter a lot of the more popular ones. This is the one goal I really have no control over, but I’m going to keep trying! How are you all doing on your reading goals? Let me know in the comments! Looks like good progress to me! Well done! I’m willing you on to 100 for the year now. Thank you!! I’m going to try my best to get there!